Garage doors come in many shapes and sizes. Their functions range from basic security of an area to cosmetic concealment. Most doors can be broken down into a few basic styles or categories. Typical modern garage doors for residential applications tend to be predominantly of the overhead sectional variety. That style of door comes in many configurations, materials, levels of insulation, and a wide range of appearance possibilities. They are available as a prefabricated kit, or built as a custom design to complement the décor of any building. Commercial warehouse type installations often dictate higher security requirements. A good choice for this security type of door is the "roll-up" style that resembles a roll top desk type of door. This door can be manufactured with a variety of materials that can be as strong as the adjacent walls, making forced entry through this opening very difficult. Other common commercial installations include light weight aluminum single or sectional panel doors. These doors function more for closing off an already secured area than for assuring point security. In the past, the biggest concern with operating an overhead garage door was the potential risks associated with the springs used for balancing the door weight. Pre mid 1960's garage door installations typically relied upon a pair of stretched (tensioned) springs to assist the operation of the garage door pivoting hinges. These springs became loaded (tensioned) as the door was moved into the closed position. Unloading (releasing) of the stored spring energy occurred as the door was opened to the horizontal overhead position. One of the most dangerous aspects of these spring systems was that after a period of time, often without any maintenance or inspection, the points of attachment of these springs would rust or become weak. This weakening of the springs or points of attachment would often lead to an inadvertent explosive failure flinging the broken spring components across the garage, embedding the spring or steel components into the garage walls, cars or other items in the path of travel. Unfortunately, sometimes people were in the path of travel of these explosive occurrences. As these springs failed, as an attempted safeguard, some manufacturers devised a "caging" system for the springs. These cages were retrofitted onto the stretched springs in an attempt to capture the parts that would release if a failure occurred. While these caging devices were helpful, they were not completely effective. Some of these spring devices are still in use today. Whenever this condition exists or the quality of garage components are questionable, a qualified professional service technician should be consulted. Spring to right of tag is broken and shows how the rod captures a torsion spring when it fails. Garage doors can be operated manually (by hand), as well as automatically (by power assisted motor). In both cases, the proper operation of the garage door is determined by the proper balancing of the garage door weight, springs and related component hardware. 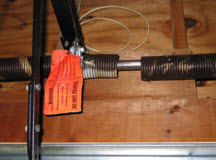 An automatic power assisted motor cannot overcome an improperly balanced garage door. The weight of all garage doors is normally deceptive. Due to the fact that a properly functioning door appears easy to open and close, many users do not realize the combined overall weight until springs fail to assist the door in its operation. In all cases, regardless of the type of garage door, the entire system of hinges, track, hardware, and door opener work as a team. Problems with misalignment, shifting, or jamming can lead to problematic operation of a door. Counter forces imparted to a garage door, not engineered into the components, can lead to injury. Inappropriate maintenance or complete lack of maintenance has lead to severe bodily injuries. Forcing the operation of a garage door, when one or more components have become damaged or broken has lead to serious bodily injuries. In all cases, maintenance is a crucial and important aspect of proper operation of all door systems. In contrast to an overhead type of garage door, be it sectional or single panel, roll up doors have a totally different type of operating system. When these doors are used, they can be concealed in an overhead or under mounted trough. These doors operate similarly to a roll top desk door except for how they are stored when not in the closed position. They normally coil as they are retracted, and require significant gear trains to reduce the effort required to move these doors up and down into position. Often the forces needed to move these roll up doors require a reduction type of transmission that allows a very heavy door to be operated effortlessly. These doors can be chain driven either manually, or can be automated using electric motors. Roll up doors require more frequent evaluation and servicing than a standard overhead garage door. The tracks that are mounted vertically on both sides of the garage opening need maintenance and cleaning more frequently, and are often blocked by foreign obstructions or damaged by collision of some type. These roll up doors are often held open by some type of ratcheting action. Proper balancing of these doors is often more important than an overhead type of door, as the weight of these type of doors is normally much greater than an overhead door. I have been involved in numerous garage door cases where many different reasons for an injury have occurred. Having been retained as expert witness for both plaintiff and defense, several common factors have been observed. In many cases, unqualified individuals have attempted to repair or install garage doors. They have lacked the knowledge, skills or even the basic required tools to perform the work safely and properly. I have been hired as an expert by garage door manufacturers and installers to defend claims that they are not responsible for alleged product defects. In most cases, the components that failed, failed as a result of abuse or improper installation on the part of the end user. As stated above, the installation of many garage doors is not appropriate for an untrained person. An exception to this relates to "do it yourself" garage door kits that are sold at local home centers. A homeowner could install the door because these kits do not come with a professional quality package of hardware that should or would require special knowledge for the installation. These kits do not typically employ torsion springs that would require special knowledge, proper tools, and working skills to install. The doors are typically for light duty use. Professional installation services are often available through a home center to assist a homeowner in need of a specialized installation. As with most trade specific tasks, years of experience working as a professional installer qualifies tradesmen for their contracting license. The average homeowner watching a few television shows that give rough explanations of how to install garage doors is not usually qualified to install his or her own door. These "how to" television shows are no substitute for the many skills acquired after working in the field. The above article is a very brief description of a few types of garage doors. Photos in this article are non specific and were meant for illustrative purposes only. I have not given any specific details regarding appropriate trade conduct or listed any information regarding the serious potential for bodily injuries.